For me, one thing and one thing alone gave Smackdown a bigger feel this week and that thing is of course the WWE Championship. It's been a long time since we've seen that title and the main story running through WWE appear on Smackdown, mainly due to John Cena not working Tuesdays. But with the title now on Randy Orton, who is feuding with fellow Smackdown regular Daniel Bryan, it certainly gave you a much stronger reason to catch up with WWE's blue show. Now I mentioned WWE Champion Randy Orton in my opening gambit this for this weeks Smackdown, and he appeared in the opening segment, after supposedly being invited to speak by Smackdown General Manager, after she patched up her differences with Triple H off screen. Randy Orton's promo was actually pretty good, it was clear that this wasn't a spontaneous promo, like one we'd see from CM Punk, but it was well written and delivered well by Orton. With Orton asking for the support of the fans, I thought this was good way for Orton to gain extra heat, as clearly the WWE fans aren't going to get behind Orton when he's up against the uber over Daniel Bryan. The face of the WWE idea seems to be sticking with Orton mentioning it a few times, and once Daniel Bryan interrupted it got brought up a few more times as well, it's good to see that phrase attach to the WWE Championship when usually it was simply given to Cena even when he wasn't walking around with the belt. With Bryan now in the ring, he put over John Cena, I'm not quite sure why, Cena is out for six months what is the need to put him over here? Bryan also called Orton pretty, quite a few times, before saying he wanted to kick him in the face with some nice timing. With a championship rematch being set for Night of Champions, Orton went for an RKO, only for Bryan to reverse and send Orton out of the ring with a dropkick. It was nice to see Bryan get the upperhand here, after taking such a beating on Raw. Later on in the show, Wade Barrett went to visit Vickie Guerrero in her office. With Barrett suggesting that he would like a rematch with Bryan to make sure he didn't make it to Night of Champions. With Vickie reeling off a number of match types, including No Holds Barred and Extreme Rules, which I believe are actually the same match, she eventually settled on a Steel Cage Match, which Barrett seemed very happy with. As was I, Smackdown has a good history with Steel Cage Matches in the past with a number of classic bouts since it's inception including Jeff Hardy vs. CM Punk in August 2009 and Eddie Guerrero vs. JBL in July 2004. I also expect the style of match would suit Barrett giving him another oppurtunity to show of his brawling style, whilst Bryan technically savvy would help to create a good story to build the bout around. However when it came to the actual match, I was slightly disappointed. The bout was afforded less than ten minutes of television time and the story really wasn't strong enough to keep me interested in what was going on, when the winner was clear. Whilst there were some nice moments, like Barrett reversing Bryan's signature comeback with a Winds of Change, and Bryan smashing Barrett into the cage whilst chanting “Yes!” followed by some good kicks, which the crowd loved, there just wasn't enough stringing them together to draw me into the bout. I think this was mainly down to the length of the match, as it didn't really allow the two to explore the concept of the Steel Cage match fully or include enough potential finishes to build up the excitement as I'm sure they would have liked. The wrestling was strong throughout as expected, and I couldn't fault Bryan or Barrett's wrestling here. Despite being disappointed by the match on the whole, the ending was very good, with Bryan stopping Barrett escaping the cage at the last minute, managing to hit a good looking Sunset Flip Powerbomb from the top rope, before picking up the pinfall victory with the same version of the Knee Trembler that won him the WWE Championship at SummerSlam. Everything about the ending worked for me, but certainly would've have been more satisfying if the match had had at least an extra five minutes to build. After the bout with Bryan celebrating, he was ambushed by Orton with an RKO to close the show with Orton holding his WWE Championship aloft. It was a good way to remind who was the face of the WWE, and having Orton end the show in control will only help to build the fan support for Daniel Bryan heading into Night of Champions and beyond. Now, this was a rematch from SummerSlam's classic World Heavyweight Championship match, now anyone that read my Smackdown review will know how much I adored that match and it was always going to be difficult going in to be able to equal that match on Smackdown. 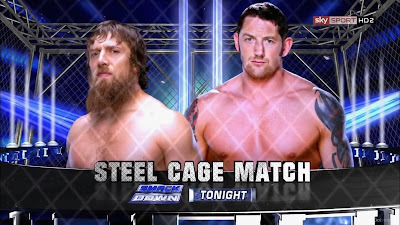 For me there wasn't really enough build up to this match, and it got lost in the middle of the show, and was certainly overshadowed by the build to Bryan and Barrett's Steel Cage bout, similar to how it was overshadowed heading into SummerSlam. The World Heavyweight Championship has certainly lost some of it's shine over the last few years and has really struggled to find a relevant role on the card, with WWE still trying to find a way to present the belt, after both Raw and Smackdown essentially merged, that makes it feel prestigious whilst it's clear that the WWE Championship is the top title in the company. Now, if you hadn't seen the match at SummerSlam this was actually a pretty good television contest, however if you had seen SummerSlam, you like me, were probably comparing it to the match they had on pay per view. Now, obviously a television match shouldn't be as strong as a match you're going to put on pay-per-view, it makes business sense, but it doesn't make sense to have a rematch the week after a fantastic match on pay-per-view on free TV! They could easily have built another match around bout heading into Night of Champions and given it even more time, I think WWE might have dropped the ball with that one. There were some nice spots like Christian getting pushed off the top rope to the floor, and Christian's impecable selling of Del Rio's attacks on his arm were once again a major part of the match, as well as some beautiful chain wrestling that saw Christian come out with the upperhand for a number of near falls. The ending played on Christian's arm injury once again, with Del Rio dodging a Spear to send Christian into the ring post in one of wrestling biggest clichés, before Del Rio used a nice transition into the Cross Arm Breaker, using the top rope, before they played out the same finish they used at SummerSlam with Christian looking to fight out only for Del Rio to gain the upperhand and pick up the submission victory. The victory for Del Rio confirmed that Christian was moving back down the card once more, as the loss was basically a way to write Christian out of the World Heavyweight Championship picture. I reckon this is a real shame, and really shows WWE's stubbornness to change things up, as the Del Rio and Christian match at SummerSlam should have had a rematch on pay-per-view. After the bout Del Rio cut a similar promo to the ones we saw at SummerSlam and one Raw, talking about how all the Latinos should follow his, as he is their leader. It was another solid promo from Del Rio, even if it was sort of going over stuff he'd already said twice this week. Del Rio was, of course, interrupted by Ricardo Rodriguez, who brought Rob Van Dam with him, and after Christian had gotten a little revenge on Del Rio with a missile dropkick, Van Dam finished off the job with a Rolling Thunder. It would definitely seem that WWE is going with Del Rio vs. RVD for Night of Champions, and whilst I'd have liked to have seen Christian get another shot, I'm sure RVD and Del Rio will put on a good match as well, if given the same amount of time. I'm also starting to like the Rodriguez and RVD partnership, Van Dam certainly works better when he doesn't have to speak with his promos usually either struggling to be serious or just looking plain goofy most of the time, this allows him to just show off his in ring skills and stay quiet. In the opening contest of the night, Intercontinental Champion Curtis Axel, accompanied by Paul Heyman, took on Cody Rhodes. Whilst it was only a short bout, the thing that work for me here was that I actually couldn't make my mind up who was going to win. Rhodes has been receiving a push recently with two straight victories over World Heavyweight Championship Money in the Bank Winner Damien Sandow (who was strangely absent from the show), whilst Axel is being positioned in a feud with CM Punk, so it really could have gone either way. Whilst the bout wasn't anything special, it flowed well and was easy to watch, with dropkicks from both men being the highlight for me as they were so well performed. The ending saw Rhodes look to be attempting a Moonsault, only for Heyman to cause a slight distraction, allowing Axel to hit the ropes and send Rhodes crashing down. Axel went on to pick up the pinfall victory with a Hangman's Facebuster. With the promo that followed it made sense for Axel to go over Rhodes, although it was a shame to see the wheels seemingly halted on Rhodes' ascent up the cards once more. With Axel and Heyman in the ring, Heyman got the microphone and cut another good promo, talking about his emotional pain due to CM Punk no longer being the Best in the World, as well as putting Curtis Axel over strongly. Even Axel himself got in on the action, and once again showed that Heyman has been helping him with his promos, as this one was solid, as he showed a lot of intensity in putting over his own personal problems with CM Punk, before finally challenging Punk to a match on next's weeks Raw. Axel plays the overly cocky heel role well, and it works great against Punk, because the audience knows what Axel is saying isn't true. Axel has never been put in the same light as Punk, and therefore it should annoy the audience when he puts himself in the same category. The bout on Raw should be an interesting one, I would imagine that Heyman will get involved at some point and hopefully come the end of the night we'll have more of an idea how Night of Champions will be shaping up CM Punk and Curtis Axel. Elsewhere, in a two on three handicap match Big Show and Mark Henry teamed up to take on 3MB. Henry and Show, of course, dominated most of the match against Heath Slater, Drew McIntyre and Jinder Mahal, which would have been even more impressive if we hadn't seen Kane do the exact same thing on his own a few weeks ago. After a Chokeslam for McIntyre and a World's Strongest Slam for Slater, Show & Henry got the pinfall victory with Knock Out Punch from Big Show on McIntyre. It wasn't a particularly pretty bout, but it at least presented the new tag team well. With Shield members and Tag Team Champions Seth Rollins and Roman Reigns appearing on the screen, both cutting good promos about on Henry and Show being past their prime and claiming to be the future of the WWE. It sets up their suspected title match at Night of Champions well, and gives it a nice passing off the torch kind of vibe for their battle. Dolph Ziggler and Big E Langston, accompanied by Diva's Champion AJ Lee, appeared to have the blow off match for their feud on the show as well, with this probably being the best televised match between the two. It flowed a lot better than their previous bouts, with Langston controlling most of the match with numerous Ziggler fight backs and near falls, including a nice section that saw Ziggler reverse a powerbomb in a sit out facebuster for two, and nice false finish that saw Lee punch Ziggler in the face, allowing Langston to hit a vicious clothesline for just a two. For the ending they simple recycled the ending to the mixed tag team match at SummerSlam with Ziggler escaping a Big Ending to hit a Zig Zag for the victory. For the time it was given the match did well, but this rivalry never really ignited like it should have with WWE losing interest pretty quickly, hopefully Ziggler can move onto something else pretty soon. Ryback appeared in another backstage segment, however this one didn't quite work for me. Some bloke was asking for an autograph for his kid, which Ryback agreed to, but when the Dad revealed he didn't actually know who Ryback was, because he didn't watch the show anymore, Ryback got pissed off and ripped up the autograph. It didn't work for me, because the Dad came across as the bad guy, who was troubling Ryback without even knowing who he was, and Ryback was deservedly pissed off at the situation. Darren Young was also in action on Smackdown, accompanied by Prime Time Players partner Titus O'Neil to take on Antonio Cesaro of the Real Americans, who was accompanied by the rest of the group. It was an enjoyable match that was easy to follow, with a good comeback from Young, before the ending sequence saw Jack Swagger try to distract Young, only to get taken out by Titus O'Neil, allowing Young to take control again hitting The Gutcheck for the pinfall victory. I have to say after watching Cesaro face Sami Zayn in that fantastic Two out of Three Falls match on NXT, that this result was a little annoying. Whilst there is no doubt that Young is a terrific all rounder, I would much rather have seen him pushed because of his wrestling ability and not because of his personal life. 1. Bryan and Barrett could have had a great Steel Cage match, if given longer than ten minutes. 2. Christian's run in the World Heavyweight Championship picture is over, hopefully he'll get ONE...MORE...MATCH in the future. 3. The Smackdown announce team is a lot easier to listen to, than when they have Jerry Lawler join them on Raw.